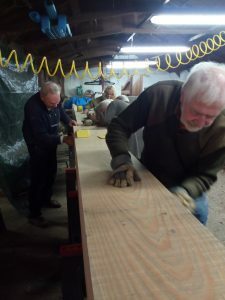 Yesterday, more volunteers met at the JE Homewood yard to finish sanding the new flagpole for St Christopher’s Church. The project team have asked me to thank all the volunteers. They have updates on Twitter here. Here are some of the volunteers who helped yesterday. With this part of the project now put to bed, we look forward to the pinning of the poppies on to the netting, which is somewhat a bigger task. This will take place in the warmth and dry of inside St Christopher’s Church. Although most of the 12,000 poppies have been made, we are still waiting for the delivery of the netting upon which they will be pinned, so I believe the team will not be starting with this until early February. However, hopefully you will find time to join us when we start this. 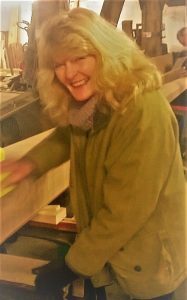 This entry was posted in Haslemere first and tagged Haslemere Centenary Project, HaslemereToday, HaslemereTomorrow, HaslemereYesterday on January 21, 2018 by admin. 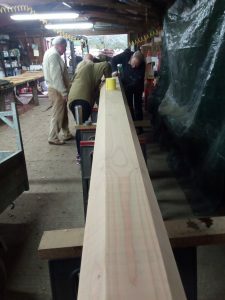 I wrote last week about the Haslemere Centenary Project. Thank you to everyone who got in touch with Ken Griffiths offering to help and volunteer for the project. Yesterday, a group of volunteers began sanding the flagpole in J.E. Homewood‘s yard. Three sides have now been smoothed down. 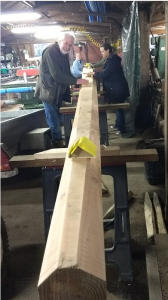 During the week, the team at J.E Homewood will turn the flagpole ready for the 4th side to be prepared. The team will meet again next Saturday to sand down the 4th side of the flagpole and to begin painting it. Thanks to Brewers for supporting this project by providing the paint. 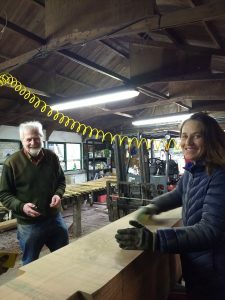 If you’d like to be involved in the Haslemere Centenary Project, please let the project team know by contacting Ken Griffiths via e-mail at ken@haslemere.com or telephone 07860 263055. 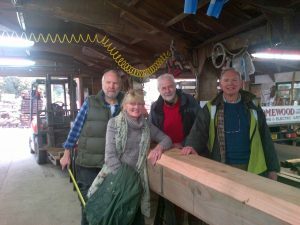 This entry was posted in Haslemere first and tagged Haslemere Centenary Project, HaslemereToday, HaslemereTomorrow, HaslemereYesterday on January 14, 2018 by admin. 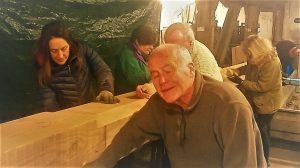 A group of Haslemere residents, have come together to mark the centenary of the end of the Great War, by creating a magnificent and thought-provoking Memorial to honour and commemorate the local men and women who were killed in the conflict. This will also act as a reminder to future generations that The Great War affected people of all nations and faiths who gave their lives in defence of freedom and democracy. Information will be gathered on those whose names appear on local war memorials in Haslemere, Grayswood, Hindhead, Shottermill, Hammer, Camelsdale and Lynchmere and the results of this research will be stored locally on a forthcoming Haslemere & District Memorial website and displayed for all to view. 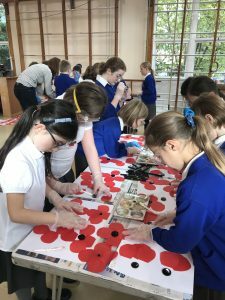 Local schools and organisations have been invited to take part in a “Poppy-thon” designed to make around 12,000 poppies, which will then be artistically cascaded on netting from the top of St. Christopher’s Church tower. To add to the spectacle, real red poppies will be planted directly on St. Christopher’s Green to add impact to the scene. 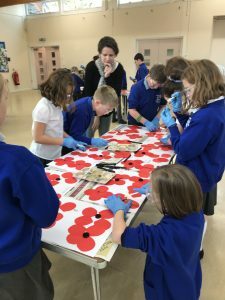 Here are a couple of pictures with pupils from Camelsdale School making poppies for the project. In addition, and to act as a lasting memorial, plans are in to replace the 35ft high flagpole on top of St. Christopher’s Church at Wey Hill. It fell into decay several years ago and after an estimate of 100 years’ service has been taken down. 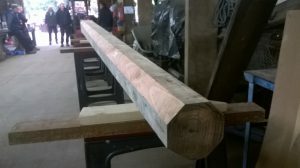 The Arts and Crafts cross that previously sat on top of the flagpole will also be reinstated and restored to its original gold to become a beacon of hope. The flag of St George will once again fly proudly from the top. The new flagpole has been cut and is now in Haslemere seasoning. See pictures below. 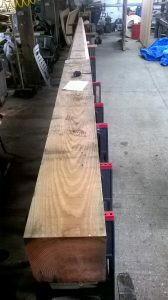 At 35 foot long and 14 inches square at the base it is a beast, weighing in at an estimated 650 kg. 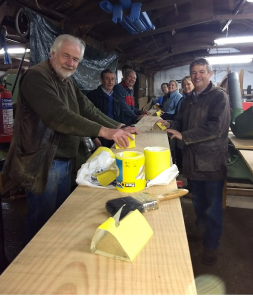 Now we are in the New Year, the project team is asking for your help to start preparing it for painting and we are looking for volunteers to spend a couple of hours of their time over the next few weekends in sanding and painting it prior to its erection on St Christopher’s Church Tower. Perhaps you can help. 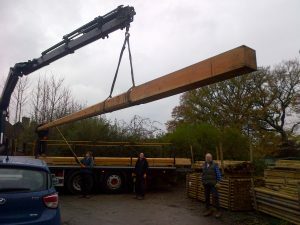 Please let the project team know by contacting Ken Griffiths via e-mail at ken@haslemere.com or telephone 07860 263055. Also, later in January / February we will be asking for volunteers to help pin the poppies on to the netting. This will be done in the dry and warmth of inside St Christopher’s Church and again we will be looking for people / groups / organisations to spend a couple of hours during the evenings to help us with this. We will of course be providing tea coffee and biscuits for all our helpers in true British fashion. Volunteers will be planting 10,000 real poppies on St Christopher’s Green and again we will need volunteers to help us. Currently it is planned that as a community, we will plant 120, 84 cell seed trays with poppies on Saturday March 24th. 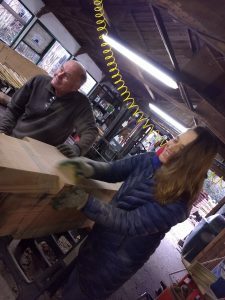 Once planted, they will need to be nurtured in a number of cold, well ventilated greenhouses and we will be looking for volunteers around Haslemere with the spare greenhouse capacity and skills to nurture them for about 5 weeks before we plant them out on St Christopher’s Green. So, rather a lot to do that will not be achieved without the support of our community. The community project team, would like to thank the many grant funding bodies, local businesses and individuals from the community who have provided us with the money for this project and we are now within a whisker of the fundraising target of £14,000. For further details on the fundraising for the Memorial project, please go to https://mydonate.bt.com/events/greatwarcentenary/447006 where you will find details on how to donate to this worthy cause. In the meantime, if you can spend a few hours helping on this community project then please sign up to help us. Go on you know you want to. 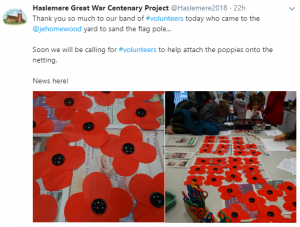 This entry was posted in Haslemere first and tagged Haslemere Centenary Project, HaslemereToday, HaslemereTomorrow, HaslemereYesterday on January 9, 2018 by admin.